It was in the beginning of the year 2014, that I stumbled upon the word "Muziris". One of my friends had started a home stay in the name of "Muziris Harbor View". From then, I kept hearing the word Muziris from every nook and corner of the travelling community. The word was quite intriguing and mesmerizing for a history buff like me. Thousands of year's worth world history is buried under the region once known as Muziris. This region is identified as Kodungallur in present day Kerala. It was only in late 2015, precisely in December 2015 that I visited the "Muziris". It was a golden opportunity as I was getting a chance to literally 'float over' the Muziris region for a day. It was through Kerala Tourism Department's Hop On Hop Off water circuit tour. It was a full day tour which coasted us 550 rupees per ticket, which includes free entry to all the Muziris museums. The story starts more than 2000 years ago. It was ages before the modern European invasion of India. Ships laden with gold, precious stones, wine, copper, brass and frankincense anchored at an ancient sea port at the western coast of Kerala - "The Muchiri" or "Muziris" - as the ancient sailors addressed it - was an important port on the ancient spice route. This route extended from the Mediterranean Sea on the West to the Eastern frontiers of Indonesia. In no time, I fell in love with the astonishing history of Muziris. I was partly ashamed and sad that I knew very little about the history of my very own land - Kerala. As I learned more, it was like opening a treasure chest and picking out precious stones and wondering "Oh, wow, I haven't seen it!" The history of "Muziris" is as ancient as the history of Kerala. This busy and prosperous Sea port was praised in the ancient Tamil poems as "The greatest of all sea ports". 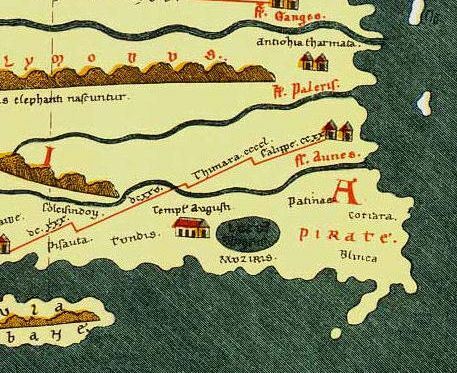 It is also mentioned in the account of Greek sailors. Historical and archaeological evidences show that the spice trade started as early as 600BC. The Phoenicians were the first to establish the trade. Later it was monopolized by the Arab. The Romans obtained the spices from the Arab traders. Arabs sold it to them at very high price, which prompted the Romans to find a direct route to that unknown heaven which produced the spices. 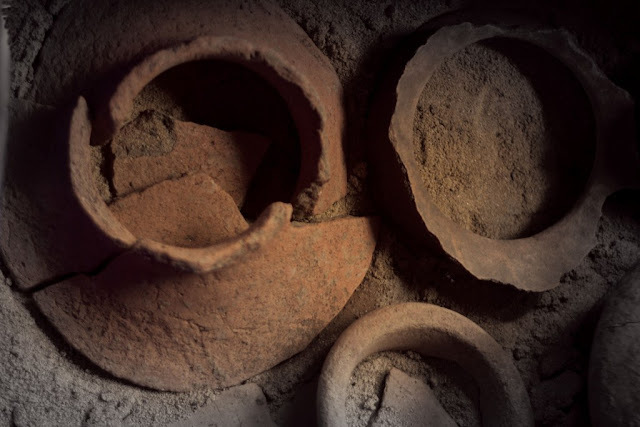 Spices were an inevitable part of Roman life. They were successful in their quest and established the trade connection with Muziris. Along with the trade came all kinds of people from around the world, they camped near the port and some of them stayed here permanently. One such community is that of the Jewish trades, whose ancient synagogues still stand erect in the Muziris areas. Now, fast forward to 2000 years. "Pattanam" is a small hamlet in Kodungalloor, located in the Ernakulum district of Kerala. It resides on the banks of the River Periyar. During the monsoon season, when a layer of earth is washed away in the rains, the residents of Pattanam noticed rather curious artifacts emerge from the ground. 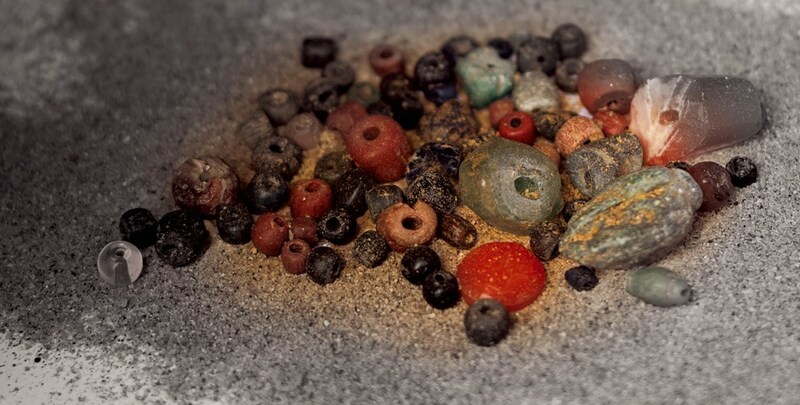 There were colorful small stones, pieces of clay ports and sometimes curious looking coins. Little they knew that they were living right on top of the ancient trade history. It evoked the interest of the archaeologists in Kerala. The "Pattanam Excavation Site" was set up. The process of unearthing one of the glorious ports of the ancient world began. 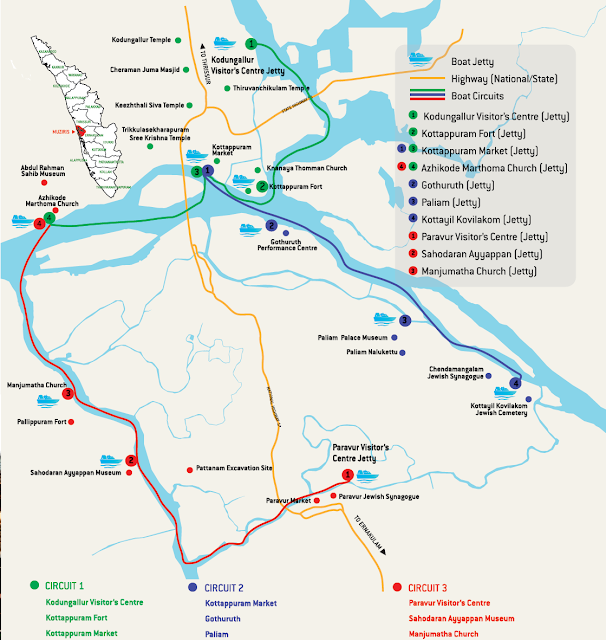 Though it is not confirmed that Pattanam is the nucleus of Muziris port, the excavation of the site and study of the surrounding areas has revealed an archaeologically and historically rich belt of riverside locations. Now, that is the history of 2000 years condensed in about 400 words! Even though there is no clear evidence, it is believed that the glory of the Muziris port fell when a there was a flood that engulfed the entire port town. The Muziris area is now open to public as a part of the Muziris Heritage Tour by the Kerala Tourism Department. Kerala archaeology and tourism department has invested a hug money in the restoration and conservation of this priceless piece of history. Tourism department also conducts the hop on hop off boat service in top class air conditioned boats which takes the following routes. It was on a fine December morning that I look the Muziris Heritage Water tour. The water tour takes you through a circuit of Jewish synagogues, the excavation site at Pattanam, ancient European forts and the palaces of the local rulers of the region. The first stop in the heritage tour is the “Paravur Synagogue”. The tickets for the Muziris water tour can also be purchased from small office near the “Paravur Synagogue”. The Synagogue looked so serene in the morning sun. There were no other visitors at that early time. It could be easily mistaken for any other old building. But as I stepped inside the humble front gate of the Synagogue, the first thing that welcomed me was this stone plate with strange looking letters. The guide book about Muziris told me that, there is much more to this plate that meets the eye. It is the very record of the history of this Synagogue. “Paravur Synagogue” or "Parur Synagogue" believed to be built in 1164 AD, however the Hebrew letters on the above stone plate particularly mentions about a renovation that under the patronage of David Yakov Castiel, a noble from the Castiel family. Through the tall facade, we entered into a pillared corridor which leads to the interior of the Synagogue. As I entered into the synagogue, the first thing I observed was the beautifully carved arch, fixed on to the wall facing the entrance. It is known as the 'Hekal'. According to the Jewish religion, 'Hekal' is the sacred place where the 'Thora' is kept. 'Thora', the sacred text is the center of Jewish belief. Most of the religious ceremonies includes reading of the 'Thora'. A special raised platform can be found in the center of the Synagogue. It is known as Bimah or Tevah. It is from this raised platform, the sacred test Thora used to be read. It was such a distinguished position in the Jewish community to stand on Bimah and read the Thora. Our guide told that most parts of original Hekal and Bimah or Paravur syanagogue was taken to Israel when the Jewish community returned. The current one is an exact replica of the original. Undoubtedly it is a very recent creation. I walked around slowly through the interiors of this ancient synagogue. The Kerala Tourism Department has placed many information panels, which explains the Jewish tradition and customs. The visit became more meaningful as I came to know the rich history of this humble looking place. When it comes to historical value, appearances are always deceptive. I couldn't proceed without appreciating the effort of the Kerala state government to renovate and preserve these monuments with such gentleness. An older picture of the Paravur synagogue would say the same. Unlike the synagogues from around the world, the ones in Kerala are customized to incorporate an important aspect of the Kerala community. It is the women participation in the prayers. According to old Jewish customs, the women are not allowed to enter the synagogue. For any public prayer to be in effect, there needs to be a quorum of 10 adult male members present. This quorum is known as the "Minyan". Women did not have any role in it. 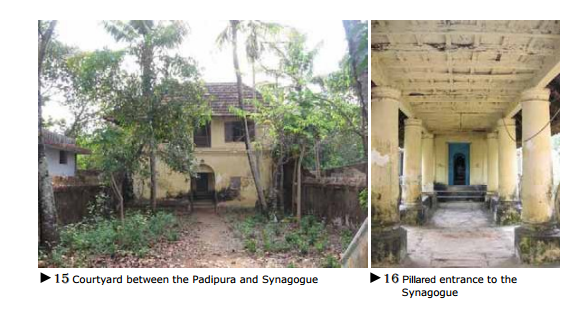 However, the Kerala synagogues are tweaked in such a way that, it has a upper floor. There are stairs leading to this floor directly from outside the synagogue. Women used these stairs and needed to stand behind a latticed wooden door known as "Melisha". There is a second Bimah on the first floor, which is used for reading Torah on special occasions. It is also a customization of the Kerala synagogues. I couldn't capture it's photo from Paravur synagogue, hence the one from Chendamangalam synagogue. As I climbed through the interior stairs of the synagogue to the first floor, I wondered how time changes everything. I am climbing through the very steps which was once forbidden for the women. The Paravur synagogue ceased to be operational a long time ago, however I silently prayed as I felt that the God would not have left to Israel. As I pass through the Melisha - the latticed wooden door of the first floor, I entered into a wooden corridor that leads to a small room. This room is known as 'Rabbanim', the place used for teaching the scriptures. The Jewish rituals and architecture is heavily influenced by the Kerala tradition. We watched a short video on the first floor. It is the reading of the ancient "Jewish copper plate" or "Cheppedu". It contains an edict issued by Kulasekhara Bhaskaravarma who ruled the Muziris region during 1000CE. It issues special privileges to Joseph Rabban and his community. It is written in ancient Kerala script known as "Vattezhuth".A replica of the "Jewish copper plate" is displayed in the Paravur synagogue. It was such a great experience listening to the ancient form of Malayalam. Being a Keralalite and a linguaphile, I could make out a few words. There are only very few in Kerala who knows to read Vattezhuth. I wished I could learn that!